These days, Islamic frames wall décor is a trend to watch out for thanks to the interesting innovations happening there, as can be seen in the online marketplace. If you look for Islamic frames wall hangingson the Internet, you are likely to come across artworks made in different materials, colours and sizes, often according to a client’s wishes. We have listed below some popular options that people go for in the current times. Wall decals are perhaps the most popular and visible option at least in the online market place the world over. You would find a variety of wall decals being sold on Amazon, Ebay and Etsy, just to take a few big names. Also known as wall stickers, these wall decals are made of vinyl, and can be easily pasted on the wall without the need of framing or drilling a hole into the wall. A more economical option than other varieties, wall decals come in various sizes. The colour is mostly black, but there are other colours available too. Composed of vinyl, the decals are sticky on the side that touches the surface of the wall. On the other side (that is, the side that is exposed) is a verse from the Holy Quran in beautiful calligraphic style. Mostly, just the Arabic verse is displayed, but sometimes there is the English translation too. Sometimes, only the English translation is there, unaccompanied by the Arabic verse. As wall decals are pasted on a bare wall, the attention of the onlookers is on the text and the message it inspires. Vinyl stickers are self-sticking and water-resistant, and can be removed conveniently from the wall.But one must take care to clean the surface of the wall before pasting the decal, or else it would stick to the dirt or oil or any other substance on the wall instead of the wall itself. If wall decals are too plain for you, then maybe you should go for digital coloured prints. 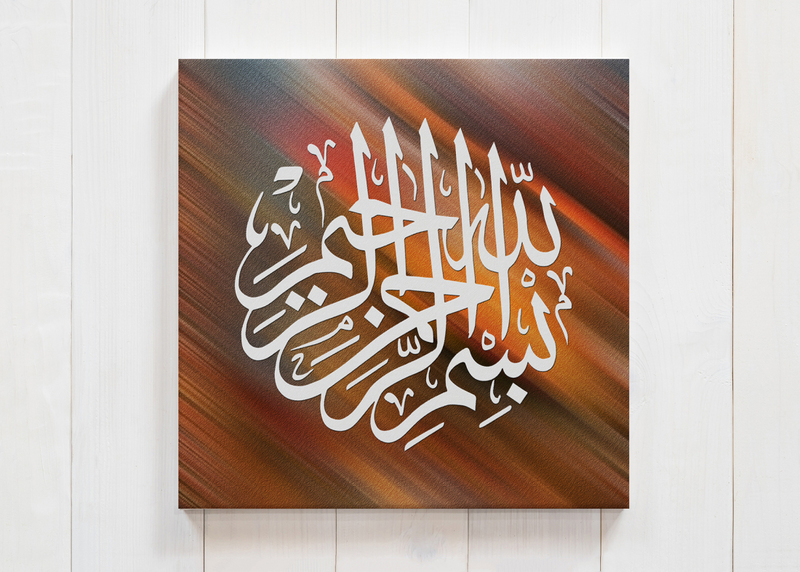 Of course, Islamic calligraphy paintings are an option too, but can be very expensive. Instead, one can go for a high-quality print of the painting. Or, as is mostly the case nowadays, one can go for a digitally coloured print of handwritten calligraphy, which is mostly written with black ink. The print material could be canvas or fine art paper or even leather. With the help of software, one can further add to handwritten calligraphy with ornate motifs, geometric patterns, stars, crescents and borders – elements typically associated with Muslim art and architecture. A canvas print, much like a painting, must be stretched over a wooden mount and does not need a glass cover – unlike a paper print. One of the most modern innovations in Islamic frames wall décor is stainless steel Islamicframes wall hangings. With the aid of machines, a stainless steel frame is neatly resized and reshaped to fit the text. The result is a beautiful work of Islamic art with a minimal yet grand look.